Wayfarer vs. New Wayfarer: Which is Right for You? Iconic is an overused adjective, but when it comes to describing Wayfarer sunglasses it’s legit. There’s truly no going wrong with Ray-Ban’s bold Wayfarer frames, however, there are some key differences between the Original Wayfarer (Model RB2140) and the New Wayfarer (Model RB2132) sunglasses to consider before choosing your new favorite pair of shades. Wayfarers were designed by Raymond Stegeman of Ray-Ban in 1952, and were one of the first sunglasses with a predominantly plastic frame. The patent from 1953 shows a pair of glasses with a subtle cat-eye shape, but it soon evolved into the familiar trapezoid we associate with the style today. Though originally marketed to men, they became popular with women quickly and are now considered a unisex style. The simple design, sculpted temples, and jaunty flair imbued the Wayfarer with a cool aesthetic. Among the stars who wore them with rebellious panache were James Dean, Buddy Holly, Muhammed Ali, and Bob Dylan. The sunglasses were a popular, mod choice for two decades, but their sales dropped so low in the late 1970s that they were almost discontinued. Then in the early 1980s, Dan Aykroyd and John Belushi wore Wayfarers in The Blues Brothers, and a young Tom Cruise flashed his pearly whites wearing a pair in the movie Risky Business. The rest was bespectacled history—sales of the sunglasses soared from about 18,000 in 1980 to 360,000 by 1983, and kept climbing. While the most familiar style is the black-framed Wayfarer sunglasses, the mid-century modern design is also popular for prescription eyeglasses and comes in a variety of color options, including light and dark tortoise, blue, beige, and with clear accents. The differences between the classic style Wayfarer and the New Wayfarer are subtle. After all, the updated version needed to retain the minimalist good looks of the original to be worthy of the name. If you tend to perch your glasses on top of your head when not using them, opt for the New Wayfarers because they’ll rest more comfortably across the lenses rather than just the lower edge. Additionally, the New Wayfarers sit closer to your eyes, while the forward angle of the classic frames lets more sunlight in from above. The temples of the New Wayfarers have more of a curve than the Original Wayfarer. Combined with the vertical lenses, this gives the New Wayfarers a slightly more modern look and fit while maintaining its hipster cred. But if a bold, retro look appeals to you, the Original Wayfarer is the way to go. 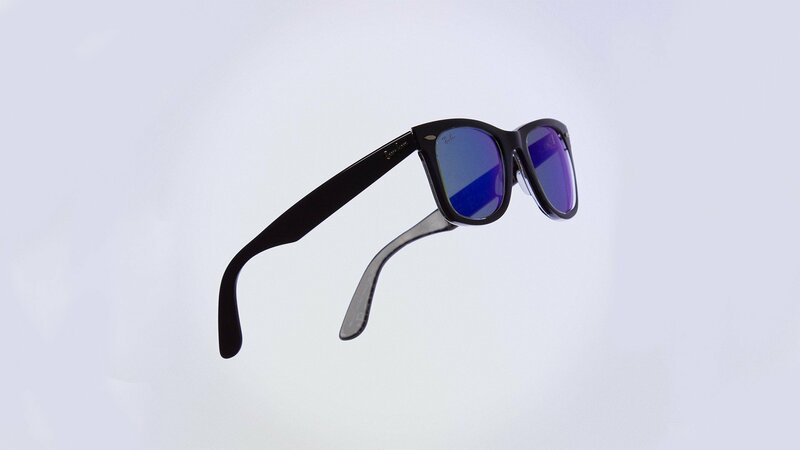 Original Wayfarers are made of hypoallergenic acetate, which is somewhat heavier than the hypoallergenic propionate used in the New Wayfarers. Both styles of Wayfarers have signature, horizontal oval metal accents on the endpoints, as well as a three-dimensional silver Ray-Ban logo on both temples. On some styles, the temple logo is inlaid rather than raised. In sunglasses, both the Original and New Wayfarers feature a small, white Ray-Ban logo in the upper right corner of the right lens. Each style also comes in an ‘alternate fit’ version designed to comfortably fit people with higher cheekbones and wider nose bridges. Beyond that, Wayfarers of either variety complement every face shape, from heart to oval to round to square. Choosing between the Original Wayfarer or the New Wayfarer mostly boils down to whether you want to go all in on hipster style, or you like the classic cool look with a modern twist. FramesDirect.com > Blog > Wayfarer vs. New Wayfarer: Which is Right for You?